Rating: 5.3/10. From 21 votes. 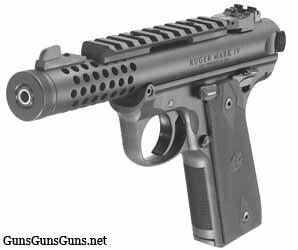 Summary: The description, specs, pricing, photos and user ratings of the Ruger Mark IV 22/45 Lite pistols. The Mark IV 22/45 Lite with the black receiver. 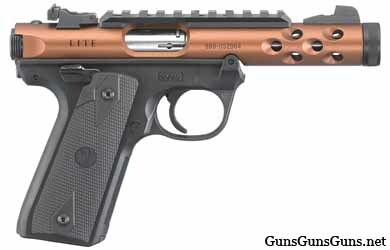 Ruger offers the MarK IV 22/45 Lite with either a bronze- or black-anodized upper receiver. On camera: Check out Hickok45’s video review of the similar Mark IV Hunter. .22 LR 10+1 4.4″ 8.4″ 5.5″ 1.22″ 25 oz. The Mark IV 22/45 Lite with the bronze receiver. This entry was posted in .22 LR, $251-$500, $501-$750, Full size, Ruger, Semiauto on February 8, 2017 by Staff. I just purchased the Roger 22/45 lite for indoor shooting competition. I put a red-dot on and sighted it in. What a pleasant to shoot. Ran different ammo through it with no problem. Because of the weight, fatigue never came in to play. Good job by Roger.